In true Berlin style, the 25th Anniversary of the Fall of the Wall was one big people’s party. The balloons of light were the most wonderful way to mark this event; a truly inspirational ‘installation’. Like smooth round angels they floated upwards, as free as the citizens of East Berlin on the night of 9th November 1989. A friend of mine was a ‘Ballonpatin’, a ‘Balloon patron’ (although I also like the translation ‘godmother’). Eva is a teacher in Köpenick, a beautiful and historic district of south-east Berlin and her school was allocated 10 ballons. ‘Their’ balloons were positioned along the stretch of former Wall at the East Side Gallery next to the Oberbaumbrücke over the Spree. This is the bridge which links Kreuzberg in former West Berlin with Friedrichshain in former East Berlin. Anyone who has visited Berlin will know that it is a unique location and the atmosphere was fantastic. Music was everywhere in the air – from Techno to church trombone bands. There were stalls selling food and drink and just by the O2 World people could stand and watch a documentary film of the Fall of the Wall. 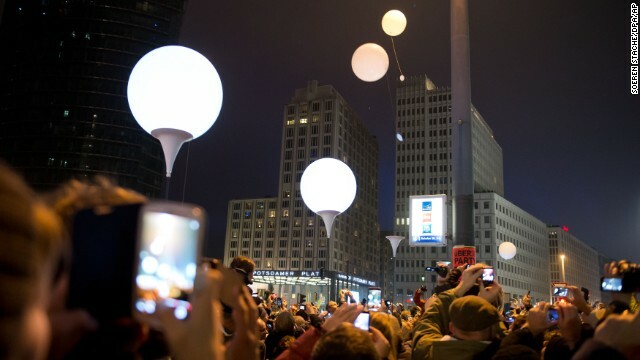 All weekend Berliners and tourists were walking along the 9 mile stretch of Berlin where the balloons stood ready, already illuminated to clearly mark the former border. The first balloon was released at about 7pm and then one by one they flew gracefully away, individually set free by each of their citizen patrons. At the Brandenburg Gate there was a speech by Herr Wowereit, the Mayor of Berlin and a performance of Beethoven’s Ode to Joy. But at the Oberbaumbrücke the celebrations started 40 minutes later when it was time to release the balloons. Everyone cheered and clapped as they watched the ethereal balls of light disappear into the night sky. The streets weren’t shut to traffic but cars simply couldn’t move at all among the jubilant crowds. The scenes were reminiscent of that happy night 25 years ago, when the border crossings were opened after a chance misinterpretation of what had been said by one member of the Politbüro. And it all happened without a shot being fired.